So, you wanna be an intern at fashion week and want some fashion internship tips. Or you're just a nosy little bugger and that's okay too, everybody's welcome here. 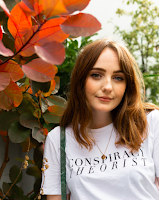 In this post I'll be sharing tips that I have learned while interning at London fashion week with Fashion Scout. You can read more about that here. 1. Fashion never sleeps...and neither do you. The industry literally never stops, even if the shows stop at 8pm, the afterparties go on until the early hours and the blog and social media coverage continues throughout the night. You should be in the know about all of these things at all times. Fashion Scout are kind enough to allow interns to use their phones at any time as long as they don't share a look before it's hit the runway. This means you'll have to have one eye on the models and the other on your phone. Heck I even had a few dreams about fashion during my internship. That's when I managed to get some sleep, that is. 2. Jump right in. Usually, I'm one of those people who sits on the sidelines and observes rather than being the centre of attention. But in this business that's not how things go. Take inspiration from the peacocks of Brewer Street; put your game face on and make sure everybody knows you're there. Sitting around waiting for someone to tell you what to do? Go and find your supervisor and ask them if they need any help. Make yourself known and make it known that you're willing to do the job and do it well. This will get you noticed and maybe even asked back next season. Just like a promotion in any other job. That's another point, treat it like any other paid job, it should be taken seriously and you should make the most of being accepted. 3. Take note. Try and remember every single show you worked on, the designers' names, the PR company involved and network with them on twitter and instagram afterwards. Mentioning that you dressed one of their shows could land you an interview in the future, you never know. 4. Get comfortable. You guys know my rule, fashion over comfort every time. But when it comes to interning, try at least to combine the two. Those heels may look good with your tight mini and stacks of rings, but you'll be screaming in pain, flashing your knickers to camera crews and losing your jewellery in a midst of cardboard boxes all in the first day. I never changed out of my new balances all week. 5. How to make your application stand out. First of all I'll let you know how I applied to be an intern at fashion week. In January, @fashionscout tweeted an email for applicants to send their CVs to. My CV hadn't been updated in years so I quickly made up a just your bog standard word document. It was about three weeks later that I heard back from them letting me know that I had been accepted and I was given provisional dates. I guess I'd been accepted because I'd shown a clear interest in fashion; I'm a fashion student, I have a blog & I've had previous voluntary work through school. If you don't have much fashion-related experience, don't fret. Try and get as many voluntary jobs under your belt as you can. Maybe work in your local charity shop once a week or help to run a charity fashion show? If you show you've been willing to work for free in the past, it's a green light. 6. Backstage passes. A lot of people have asked me what my fashion week internship entailed. I was part of the backstage team -we got to say our preference when we were accepted- as opposed to front of house. Front of house means packing goodie bags, setting up the showspace and welcoming guests, meaning you get to see more shows and meet more celebs. As a backstage intern at fashion week, my main job was to dress the models before they walked, meaning I got to preview the collections before anyone on the frow got a whiff. Ooh, how exclusive ;) It was a little stressful at times, especially if your model had 4 looks within 5 minutes all of which included plenty of layers, difficult wigs and buckled shoes. Thankfully I avoided any major dramas, but let it can't hurt to have a safety pin and some double-sided sticky tape on hand, just incase. I did have a few less-glamorous jobs too though, like carrying boxes, taking the bins out and removing flooring. Let's pretend that part didn't happen, eh? 7. The benefits of the job. The main benefit, like from any other unpaid internship, is the experience. 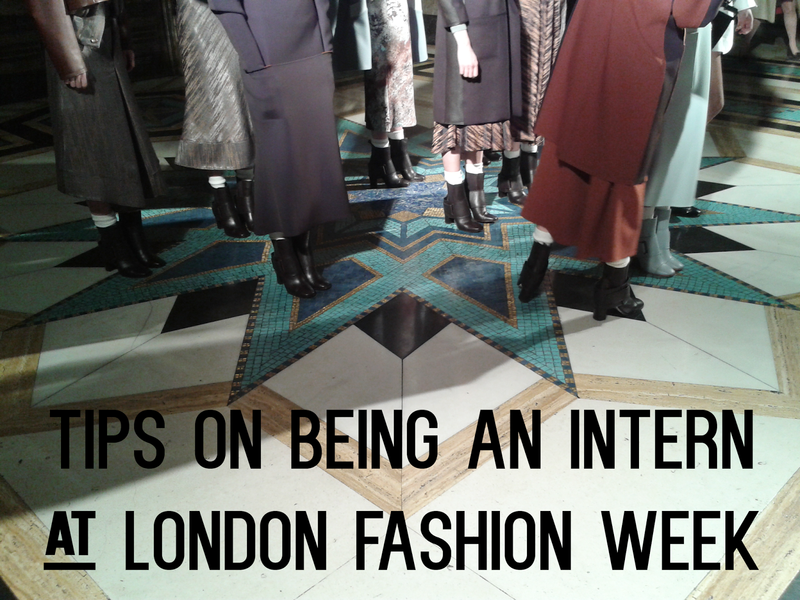 I've now been an official intern at London fashion week and learned plenty of skills along the way. I can put dresser on my CV as well as name dropping all the wonderful people I've worked with. Plus, Fashion Scout is a reputable business which will catch an employer's eye. I learned an awful lot in the space of a week about how the industry works, what different people do and the preparation involved for fashion week and I genuinely feel that this puts me in a better position than other people who might be going for the same jobs as me. 8. Go for it. If you're shy, inexperienced or live as far north as you can imagine, it doesn't matter. Just go for it. You'll meet lovely people who might become good friends of yours, even if you're not that good at approaching people. Don't worry about how much experience you do or don't have, the whole point of this internship is to give you experience. You probably know I'm from the North West so obviously it's not that easy for me to just pop down to London, especially as I found out I'd got the job quite last minute meaning train prices are sky high. Book a coach, they're kinda cheap and do a bit of couch-surfing. Or maybe you could find another intern through twitter or university etc and share a hotel room? Although this is still ridiculously overpriced...But it will be worth it. The experience is invaluable and if you go for an internship at fashion, good luck! So there are my fashion internship tips and some advice on how to intern at fashion week. I hope you found these tips helpful! Thanks for this post! If I'm not working full time next year I was thinking of applying so this is so useful! hey! I really want to volunteer at LFW next month - do you think I'm too late? I've looked on Fashion Scout's website but no mention of interning...Any advice would be great!